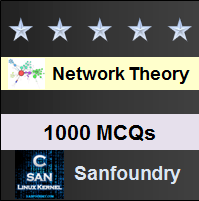 This set of Network Theory Multiple Choice Questions & Answers (MCQs) focuses on “Kirchhoff’s Voltage Law”. Explanation: KVL is based on the law of conservation of energy. 2. In a circuit with more number of loops, which law can be best suited for the analysis? Explanation: KVL can be best suited for circuits with more number of loops. 2 + 1 + V + 3 + 5 – 30 = 0. Explanation: First, apply KCL to the second node i.e, i6 + I = i8 . Next, apply KVL to the first loop i.e, -20 + V2 + V5 =0. But V2 = 7*2=14V. Obtain V5 and I5=V5/5. Again apply KVL to central loop i.e, -V5 + V6 + V = 0. Apply KCL to the first node again, seek the value of V6 and finally we get V.
+30+9-V = 0. then, I=V/8. Explanation: According to KVL, the sum of all voltages of branches in a closed loop is zero. Explanation: Apply KCL to the node, we get i – 2i1 – 0.02 – i1 = 0. Next, apply ohm’s law to each resistor, i=v/4000 and i1= -v/6000 and substitute in the above equation. For the power supplied by the independent source P = V*0.02A. Explanation: First, apply KCL to the second node i.e, i8 + I = i10 . Next, apply KVL to the first loop i.e, -20 + V i1 + V6 =0. But V4 = 4*4=16V. Obtain V6 and I6=V6/6. Again apply KVL to central loop i.e, -V6 + V8 + V = 0. Apply KCL to the first node again, seek the value of V8 and finally we get V.
-12-7+V = 0. then, I=V/300.